And that’s because that’s how I wanted it. It’s under my maiden name on purpose. Just sayin’. It’s the fear of it all, especially being vulnerable… But I do know that being real helps me and it just might help you if you can relate. If not, you’ll have a good story to read. I use to have an eating disorder. Binge Eating Disorder to be exact. It was something that I felt controlled by and something that I struggled with for years. It started when I was about 16 years old and carried into my twenties, along with dabbling with starving myself and making myself throw up. I think I covered it up pretty well, but the inside was a whole different story. What started out as a rebellious, if you will, act transformed into me feeling like I was suffocating and not knowing how to get out. Eating disorders are awful and play such a mental game on a person, along with diminishing any self-confidence that used to be there before. Long story short, but after therapy I was on my way to recovering from Binge Eating Disorder. The best part (if I can say that) is that I grew so strong and became so motivated to share my story with others in hopes of it helping someone else. Throughout my therapy sessions, I read personal development books so I could grow my mental game and be as prepared as possible. I journaled throughout it all and and the thing that once made me so powerless to it was now the thing that provided me the power to be better and help others. It gave me a platform that I just knew I wanted to take on. I spent many hours writing, both during the messy side of it and on the recovery side of it. All of that writing became an eBook, where I could share my story and what I did to get better so that I could provide hope to others that there was a light at the end of the tunnel. I remember thinking something wasn’t right with my relationship with food, but this was early 2000’s and there was hardly anything written on the subject of binge eating. All the information seemed to be about the other two big eating disorders: Anorexia and Bulimia. I remember wondering to myself, “Am I the only one?” Once I got better, that was the fuel behind my fire. 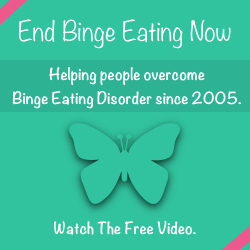 I wanted others to know that they were not the only ones dealing with binge eating. That yes, it is a real thing and yes, everything you are feeling is normal. I launched my website, End Binge Eating Now, where I promoted my book, but also shared some really private journals too. I was so scared to put myself out there, but I knew deep down in my heart that I needed to do it. And you know what? It was so positive. The outpour of love from others that read my eBook made me feel like I was really making a difference. I started doing 4- week eCourses for handfuls of people quarterly so that they would have my undivided attention and that was such an amazing experience too. There’s obviously a lot more I want to share about binge eating and the time that it was in my life, but I have a different idea right now. I’m going to share more details in future posts with you, but right now I want to talk about the present. Why did you bring up your past then, you might be wondering? It’s important because binge eating disorder stole a lot of my life. It took me a long time to overcome it and I did so with my mind, nothing else. I talked about why I turned to food in the first place with my therapist and then I grew my mind. I journaled. I pictured my perfect day. I said affirmations daily. I really immersed myself in the self-development world. At this time, I didn’t even watch television. Y’all, I was focused. One of the biggest questions I got from the awesome people I worked with was, “How do I lose all of this weight?” My response, every single time, was, “The weight loss will come. You need to fix the inside first and then you can fix the outside”. I never shared diets, nor did I focus on diets for myself. I grew up watching my mom try every single diet on the planet and didn’t want to do that to myself. Plus, when I restrict myself from something, I want it even more. Does that resonate with you? Fast-forward to present day. I told you yesterday that I weigh more now than I ever have, pregnancy include. Seriously gulp. I’ve gained weight because I’ve gotten used to having wine just about every single night and with the wine comes the poor decisions. Goldfish at midnight? Duh! Queso & chips? Yes please! My weight gain is 100% due to my wine-drinking and poor decision-making, not anything to do with binge eating. And that’s really important for you to understand. I have not binged on anything since 2004. My current weight gain is because I’ve just not put myself and my body first. I got lazy. I wanted the chips and the queso and the blue margarita that went with the queso. I didn’t exercise. I’m not proud of it, but yeah, it’s my own fault for where I’m at. Bad decisions and eating out a ton. Throughout the past week I’ve really looked around online and thought about a plan that I could stick to that would help me to lose this weight, but that would also be a way of eating the majority of the time. Knowing me, I don’t want to count anything. I also don’t want to have to think too much about calories, carbs, and fat. I need flexibility and something that flows well with the foods that I like to eat. I’m not into sweets at all. I mean, sure I like the occasional Hot Tamale or Gummy Bears (only the Haribo ones though), but I am such a lover of the salty foods. Salty foods are my jam and therefore my weakness. Hands down. I know I’m probably the last person in the world that has not tried the Keto Diet, but it’s true. Or it was true until today because that’s what I’m doing. As a way of life completely, but, not gonna lie, I hope to lose a few pounds quickly during this first week because I’m such an instant gratification kind of girl too. Hey. Just being honest. So that’s my first major change. Next up, alcohol. In true Kristin form, I go all in or do nothing, so I’ve given up all alcohol. My initial goal is for 30 days, but I’d like to carry it over until my 39th birthday on May 12th. I’ve never been the kind of girl that drank every single day, but it’s just become a habit over the past year. Alcohol seems like it’s just what you do when you’re a grown up. Kids Party? It’s there. Out to lunch with girl friends? Of course I’ll have a glass of Chardonnay. Baseball game? Ziegenbock all day long. Mexican food? Oh, blue margarita, you are so yum! Mani & Pedi? Can’t wait to relax with my champagne. It’s seriously everywhere! But it’s a habit that I’m desperate to change. Besides not making me feel good about myself and besides the weight gain, I wonder if it’s aging me? You know those before and after pictures you see of people who went 30+ days without alcohol and their skin is amazing, not to mention how fantastic their waistline looks? Yeah. That’s my goal too and before you even ask, of course I have my before photo ready to go! Besides the big ones up above, rising to my best life means including a few other healthy habits, too. It’s funny because I used to do these things in the past and then I just got away from them. Next up, tea. I’ve always had a love-love relationship with tea. I was first introduced to it at the last job I had and loved it right away. It was a staple in my life for many years until it wasn’t anymore. Maybe I grew up and branched out to wine, I don’t know. But it’s back and I’m excited to drink warm delicious soothing tea again. Another habit I’m going to start is to move for at least 30 minutes per day. It doesn’t have to be anything elaborate; just 30 minutes every single day. The final habit to help get me to living my best life is to read more and watch less. Remember how I mentioned earlier that I used to not even watch tv? Like I’m talking I had a tv but didn’t even have cable. That’s how little I used to care about television. And now? Whoa. Night and day. There’s The Bachelor (how will my life go on without knowing if Colton is still a virgin?! ), Manifest, Impractical Jokers, The Passage, A Million Little Things, Chrisley Knows Best, FBI… and those are just the “regular” shows. That doesn’t even include football & baseball (Go Astros & Texans), reruns of Friends, catching Mean Girls for the millionth time, going to the movies, or Netflix & chilling. It’s a lot & there’s probably other things that I didn’t even mention. Crazy, isn’t it? Do you watch that much television? Prioritizing is key and I know that if I want to live my best life, if I want to be the best version of Kristin I can be, if I want to meet my potential in Heaven and know her so deeply, I need to stop watching so much dang television. I need to use that time to continue to grow my mind, which will help me to be a better me. So, weekends are free game for television, but Sunday – Thursday is a different story. It will look different weekly, but my goal is to watch television two nights and read three nights. I’m so excited about these changes and today has been an amazing day! I am happy to share all of this with you and to hold myself accountability… because I’d by lying if I told you that, while I feel like I’m rocking it today, my track record isn’t too successful. I also know that failing so many times has led me to this greater place and this girl is ready to stop wasting her life and start living her best life ever. Here’s to the next 30 days. Here’s to the rest of my life. Here’s to the happiness. Here’s to the hard times. Here’s to all of the growth that happens to me during this time. Most importantly, here’s to believing instead of giving up on myself.